Setting up a Facebook feed is usually a one time process which is most often neither updated nor modified unless faced with some issues. The usual setup of the feed is to make sure that the mandatory fields are covered to run the ads. These fields usually include the id, availability, condition, description, image_link, link, title, price, gtin, mpn, or brand. While these are required to run dynamic product ads, there are some additional fields which can send more data and make your feed information rich. This additional information can be used for both your ads as well as your dynamic creatives. Let's take a look at some of those fields, which will add value and help you improve your performance. The Additional_image_link is one of the most underrated field in the feed. Facebook allows you to add a maximum of 10 additional images to each of your products. To add them to the feed, simply generate them as comma-separated URLs. Pro Tip: ROI Hunter users are able to automatically add the additional image links for each of the products in the feed. While color might seem like just a basic field, with creativity it can be used in many different ways. For e.g. For Valentine's day you will be able to filter all the products in red color and promote them specifically for that day. The same goes for the color green on St.Patrick's day, orange on Halloween, red & green for Christmas, and simply any color you want to promote. This can even help you create promotions if you don't have any. For. example a fashion store promoting all black clothing for the weekend with a special promo code can be easily achieved if the color information is passed in the feed. Each company has a different business model in terms of pricing and promoting the products. It can range from no discounts policy up to a 90% discount flash sale. If your store has any form of sale where products are discounted, then sending the sale price details in the feed is highly recommended. You can promote the products on sale by highlighting the sale price in the ad copy or even in the image itself while creations promotional ads. Discount percentage field in the feed is a virtual field created in ROI Hunter by automatically calculating the discount, taking into consideration the price and sale price of the product. You can calculate this data and send it in the feed to be mapped as a custom label. You will be able to create product sets based on discount percentage. For example filter all products with over 50% discounts and create a product set to promote these discounted products only. 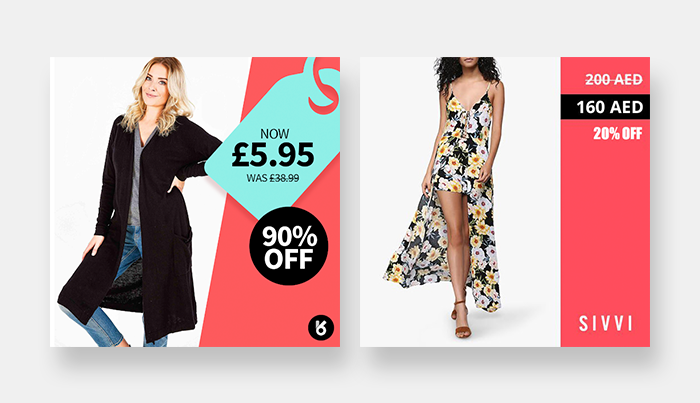 This discounts percentage can also be used directly on your ad template to highlight the sale. Here are a few creative examples below. What are these custom labels? They are simply the 5 available custom fields to send any info about your product to Facebook and use them creatively in your ads and images. The custom labels can be used for both creating relevant product sets as well as adding this information to your creatives. Let's look at some of the fields used by advertisers. Social proof has always proven to be successful and there is no exception to the product rating from your store. The product rating can be a decimal value or simply a number from 1-5 which represents the star rating. Represent the rating as actual numbers or stars in your ads. Some products qualify for Free delivery or Fulfilment of the order which can be passed on to the feed. This data helps us to easily create a promotion only for products with free delivery or fulfillment. This can also be highlighted in your creatives and increases the influence on the purchase process. While seasonality is not applicable to every retailer or store, this really helps the fashion stores. By sending the details of the collection or the season, you are able to easily promote new collections, prepare for the upcoming season, clear stock from the current season, etc. E.g. New Arrivals, Summer Sale, Winter collection, Denim Collection, Cartoon Characters, etc. With over hundreds of thousands of products in your feed, selecting products that influence your business directly is a time-consuming and challenging task. However, if you would like to have complete control of what you promote and how it influences your business, then the profit margin and stock availability fields come to the rescue. Both these values can be sent as absolute numbers or fixed values such as "very low", "low", "medium", "high" and "very high. For. E.g. creating different ad sets based on the stock availability helps you set a lower budget for products with lower stock and vice versa. Not every company/marketer has the same attribution window or measures results from the same data source. This changes based on the business model, decision makers, and various other factors. Imagine how useful it would be if you were able to promote products on Facebook based on the product insights from Google Analytics? 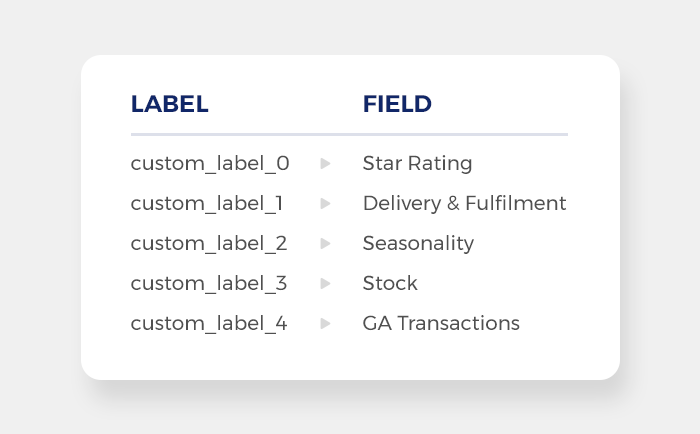 It's super easy to do this with ROI hunter, where you simply need to connect your GA profile to the feed and map one of the available custom labels to a GA field such as revenue, transactions, etc. This allows you to create and promote product sets exclusively based on GA data. You can select and promote the best selling products from your feed. They can either be the top 10% of your feed or it can even be the top 1,000 products that generate the maximum revenue. This can be combined with specific categories as well if you want to focus only on a few categories. While the bestsellers data is based on the number of transactions, the high-value products will be based on revenue. By selecting the products which have the maximum revenue or vice versa, marketers are given the opportunity to promote products based on their KPI's. You can also combine both best-sellers and high revenue products to have the best prospecting product set. Pro Tip: Create product sets for the best sellers as well as the high-value products and then split test both of them against the same audience to understand which product set works the best for your store. For more information, reach out to your Customer Success Manager today or if you are not a client already, Request a Demo here! Download Sample Product feed from here!